Protest leader Suthep Thaugsuban has reaffirmed that the anti-government People’s Democratic Reform Committee (PDRC) did not reject the election, saying it should be postponed to open the way for political reform which could take at least a year or a year and a half to finish. Suthep told his supporters on Monday night at Rajdamnoen rally site the PDRC opposed the election which will be organised under the existing system but want a new system which will prevent corrupt politicians from politics. He claimed that the existing rules of election has opened ways for vote buying which was the cause of corruption. Once some laws have been rewritten, some articles in the Constitution have been amended in accordance with the political reform, the general election could be held and democracy could move forward, he said. The former Democrat MP also said the PDRC wants a free and fair election in order to get good MPs and good government. Therefore, he stated that the poll should be delayed for reform which could take a year or a year and a half. The urgent matters needing to be addressed were how to ensure the free and fair election; corruption eradication; decentralisation and giving more power to the people; to narrow the income gap in society, and to reform the structure of the police, he said. Suthep claimed that the rally is gaining more support from the people and that provincial committees of the PDRC have been set up in many provinces nationwide as well as in Los Angeles, USA. (Reuters) – Thai Prime Minister Yingluck Shinawatra dissolved parliament on Monday and called a snap election, but anti-government protest leaders pressed ahead with mass demonstrations seeking to install an unelected body to run Thailand. Protesters have been on the streets of the capital for weeks, clashing with police and vowing to oust Yingluck and eradicate the influence of her self-exiled brother, former prime minister Thaksin Shinawatra. The clashes petered out last week as the nation celebrated the revered king’s birthday, but political hostilities are set to resume in earnest. The demonstrations are the latest eruption in nearly a decade of rivalry between forces aligned with the Bangkok-based establishment and those who support Thaksin, a former telecommunications tycoon who won huge support in the countryside with pro-poor policies. “At this stage, when there are many people opposed to the government from many groups, the best way is to give back the power to the Thai people and hold an election. So the Thai people will decide,” Yingluck said in a televised address as thousands of protesters resumed demonstrations across Bangkok. The leader of the anti-government movement, Suthep Thaugsuban, said he would not end his demonstrations and would continue a march to Yingluck’s offices at Government House. “Today, we will continue our march to Government House. We have not yet reached our goal. The dissolving of parliament is not our aim,” Suthep, a former deputy prime minister under the previous military-backed government, told Reuters. Police estimated as many as 50,000 people joined protests at different sites in Bangkok. Yingluck’s Puea Thai Party won the last election in 2011 by a landslide, enjoying widespread support in the north and northeast, Thailand’s poorest regions. The Democrats have not won an election in more than two decades. Suthep, aware that Yingluck would likely win an election if one were called, has been urging the setting-up of a “people’s council” of appointed “good people” to replace the government. Yingluck has dismissed the idea as unconstitutional and undemocratic. Underscoring the divide, the pro-establishment opposition Democrat Party said on Sunday all of its members of the House of Representatives would give up their seats because they were unable to work with Yingluck’s ruling party. Without the Democrats, the 500-member lower house will have 347 members. Calling an election will not end Thailand’s political deadlock if the Democrats boycott it, says Pavin Chachavalpongpun of Kyoto University’s Centre for Southeast Asian Studies. In 2006, amid mass protests, the Democrats refused to contest a snap election called by Thaksin, who was deposed by the military five months later. “It seems like Thailand is going nowhere,” he said. Suthep has told his supporters they have to take back power from what he calls the illegitimate “Thaksin regime” and that they cannot rely on the army to help. The army, which ousted Thaksin in 2006, has said it does not want to get involved though it has tried to mediate. Thaksin fled Thailand in 2008 to avoid a graft conviction but has remained closely involved with his sister’s government. The protests were sparked last month by a government bid to introduce an amnesty that would have expunged his conviction. (BBC) Thai Prime minister Yingluck Shinawatra has ruled out an early election, following six days of protests aimed at removing her from office. She told the BBC the situation in Thailand was not calm enough for polls. She also said she would not authorise the use of force against protesters occupying government ministries. She was speaking after demonstrators forced their way into the army headquarters in Bangkok and held a demonstration there. Ms Yingluck has been prime minister since 2011, when her Pheu Thai party won a general election. In an interview with the BBC’s Jonathan Head on Friday, she said that if she called a new election, she was not sure the protesters would be satisfied. “I love this country. I devote myself to this country. I need only one thing for the country: we need to protect democracy,” she said. She said the situation in Thailand was “very sensitive” and repeated her call for negotiations to resolve the crisis. On Thursday, Ms Yingluck called for an end to the demonstrations after surviving a no-confidence vote. However protest leader Suthep Thaugsuban has rejected her appeal. “We will not let them work anymore,” the former senior opposition lawmaker said in a speech late on Thursday. On Friday at least 1,000 protesters forced their way into the army headquarters compound, but did not enter any buildings. The BBC’s Jonah Fisher, who was at the scene, said protesters were massed on a lawn listening to speeches from leaders on a stage they had erected. They urged the army to come out in support of the demonstrators. “We want to know which side the army stands on,” Reuters news agency quoted one protester as saying. Our correspondent described the atmosphere as good natured and said the authorities appeared keen to avoid confrontation. The protesters later left peacefully. Demonstrators have been surrounding and occupying official buildings this week in an attempt to disrupt the government. During the demonstrations, which have been largely peaceful so far, participants have previously cut the electricity supply to the national police headquarters and forced the evacuation of Thailand’s top crime-fighting agency. The protesters say Ms Yingluck’s government is controlled by her brother, exiled former leader Thaksin Shinawatra. Mr Thaksin, one of the most polarising characters in Thai politics, was ousted in a coup following protests in 2006. He now lives in self-imposed exile overseas, but remains popular with many rural voters. The protesters tend to be urban and middle class voters. Ms Yingluck has invoked special powers allowing curfews and road closures, and police have also ordered the arrest of Mr Suthep – but so far no move has been made to detain him. An estimated 100,000 opposition supporters protested in Bangkok on Sunday, although the numbers appear to have dropped significantly during the week. The country is facing its largest protests since 2010, when thousands of “red-shirt” Thaksin supporters occupied key parts of the capital. More than 90 people, mostly civilian protesters, died over the course of the two-month sit-in. The proposed passage of a controversial political amnesty bill, which critics said would have facilitated the return of Thaksin without having to serve jail, reignited simmering political tensions. The Senate rejected the bill, which sought to cover offences committed during the upheaval after Thaksin was removed from office. Ms Yingluck said she accepted the vote and would not resubmit the legislation. The leader of Nepal’s Maoist party has threatened to boycott parliament if vote counting in this week’s “rigged” elections is not immediately halted. Pushpa Kamal Dahal, better known as Prachanda, alleged that there had been widespread fraud in the polls which amounted to a “conspiracy”. But the Election Commission has rejected his demand. Early results showed the Maoists trailing in the vote, seen as vital in moving towards political stability. The vote is the second in Nepal since a 10-year Maoist revolt ended in 2006. The previous assembly failed in its task to draft a new constitution. It was elected in 2008 after the overthrow of the monarchy but was bitterly divided. Addressing supporters in Kathmandu on Thursday, Prachanda said that vote-counting should cease to allow for an immediate investigation. “We have clearly demanded that there should be a probe of all election processes before the next step,” he said. At a press conference he said that he accepted the “people’s verdict but cannot accept conspiracy and poll-rigging” because, he said, ballot boxes were tampered with while being transported from polling stations to counting centres. His boycott warning came after latest poll results showed that the centrist Nepali Congress party was leading in many constituencies across the country, with the Maoists trailing in third place. Prachanda lost his seat in Kathmandu constituency, but is leading in another seat in the southern district of Siraha. But Chief Election Commissioner Neel Kantha Upreti told the BBC Nepali Service that counting of the votes would continue even if some politicians boycotted the ballot. Officials said turnout in Tuesday’s election was 70% and voting was largely peaceful, despite sporadic violence on the day and a series of attacks in the run-up to the vote blamed on opponents of the poll. 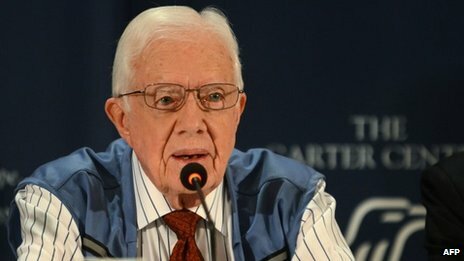 Foreign observers including former US President Jimmy Carter and the European Union have described the vote as being well conducted. “The international observers, the domestic observers and all the major parties say it was surprisingly good and fair and already proven to be [a] safe election,” Mr Carter told the AFP news agency on Wednesday. The Maoists won the largest number of votes in the last election, but failed to secure an outright majority. Prachanda became the country’s first post-war prime minister in 2008, but resigned nine months later following a disagreement with the army. Full results are not due for several weeks. No clear winner is expected. The Himalayan nation became a republic in 2008, ending 240 years of monarchy. Five governments have come and gone – two of them headed by the Maoists – since the elections in that year.